Balmy weather, white beaches and a fun holiday vibe are just a few of the reasons parents love Hamilton Island. From swimming and beach time for toddlers to mini golf for tweens and jet-skiing for teenagers, this is one destination that will keep boredom in check. The same goes for parents, who’ll be occupied by so many activities they’ll forget about flicking through Twitter. Adventurous families will especially love hiring stand-up paddleboards, kayaks and exploring the underwater realm on a snorkelling tour. Whether you prefer the convenience of a hotel pool or the sand and salt of the beach, a holiday on Hamilton Island is all about getting wet – and there are plenty of places to do so. Catseye Beach is the main island beach and the go-to place for hiring water-sports equipment, such as catamarans and kayaks. It’s also a good launching point for self-guided snorkelling adventures, with a coral reef not far from shore. If you’re hankering to open that novel you packed, there’s nothing like lying back on a towel while the kids kick a ball around or build sand castles at your feet. As for pools, most resorts have one and, if they don’t, you’ll find there are agreements between properties. One of the best family pools on the island is at Reef View Hotel. At 35 metres, there’s plenty of room for everyone. There is also Bougainvillea Pool, which not only has killer views of Catseye Beach through a curtain of palms, but is also open from sunrise to sunset. Other options include Main Pool (shout the kids a mocktail from the swim-up bar), and Sails Pool, next to Sails restaurant. Parents can pack light for a holiday on Hamilton, with the daytime temperature averaging 27 degrees. On the same latitude as Honolulu, Hawaii, families can expect the very best of Australia’s tropical climate, with plenty of blue-sky days and refreshing night-time breezes. In the summer months, occasional rain showers will wash away the heat, while in winter you’ll relish the mild weather. Hamilton Island is the largest inhabited island in the Whitsundays at five square kilometres, yet it’s still relatively small, especially when you stick to the two main precincts – the resort hub and the marina. It’s also hilly, which helps prevent tiny legs from wandering far without mum or dad tagging along. Nevertheless, kids will be too entertained to do so anyway, with plenty of fun to be had at the hotels, activity centre, beach and Marina Village. 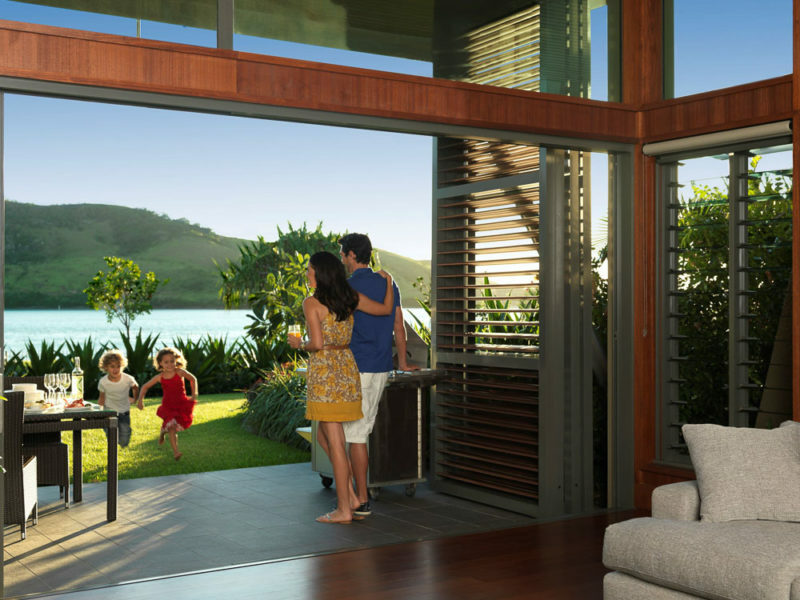 Made for families who enjoy the finer things in life, you’ll never feel out of place at one of Hamilton Island’s numerous child-friendly eateries. There are plenty of great seafood options, including Manta Ray and Mariners (order the seafood platter) at the marina. If you’re staying at qualia, make a reservation at Pebble Beach for the ultimate in island fine dining. For somewhere a little funky, head to coca chu, which specialises in mouth-watering Asian street food to share. If you have fussy eaters or want something tried and true, grab a table at Pizzeria and Gelato Bar, where you have a choice of 20 pizza toppings. For days when it’s hard to get the kids out the door, swing past Bob’s Bakery on Front Street for a pre-tour snack, and there’s always the Ice Cream Parlour for post-tour treats. Forget packing the kitchen sink, day trips are made easy on Hamilton Island. You have to, really, you do: a daytrip to Whitehaven Beach from Hamilton Island (photo: Tourism QLD). One of the best is cruising to Whitehaven Beach, the poster child of the Whitsundays thanks to its silica sand and sapphire water. Hop aboard Explore’s Sail & Snorkel Whitehaven and Chalkies Beach full-day excursion during which you’ll not only get to swim at Whitehaven but will also enjoy a snorkel at Chalkies. The minimum age for children is five, and all snorkelling equipment is provided. If your child is under five, a great alternative is joining a Cruise Whitsundays’ tour, but be sure to pack a few toys and a beach shade. Along with all the water sports on offer, Hamilton Island is a top destination to stay active – and to encourage the kids to be as well. Pack a day bag and lace up your joggers for a morning exploring the island’s numerous walking trails. Hike to the tip of Hamilton for stunning views of the Whitsundays and then descend to a quiet cove for a refreshing dip in the sea. If you have a toddler, bear in mind there are no toilets on the trails, and you’ll also want to pack motivating treats for longer explorations (bliss balls work well). Check out the numerous tracks here. It’s highly likely you’ve heard all about Hamilton’s award-winning qualia resort (if you haven’t, where have you been?). It’s the kind of place you can expect Australian celebrities to hide out, along with high-flying entrepreneurs. Check out our latest qualia review. But that doesn’t mean families who like travelling in style are excluded. The only catch is that children need to be at least 16 years of age. If that’s the case, book a pavilion and start planning a pampering escape both parents and teens will savour. For those of us who prefer more low-key but still impressive digs, you can’t go past Reef View Hotel. It’s a skip from Catseye Beach and has a huge range of rooms for all types of families. The island also has plenty of self-catering holiday homes and bungalows, which are great for groups. Family holidays are an absolute hoot but let’s not pretend that our little rascals aren’t the only ones that need the occasional time out. Parents need to recharge, too, and Hamilton Island is ideal for this. Tag team with your partner and spend a couple of hours at Spa wumurdaylin or Spa qualia (for qualia guests), and then return the favour by booking your spouse an afternoon on neighbouring Dent Island for a round of 18-hole golf.